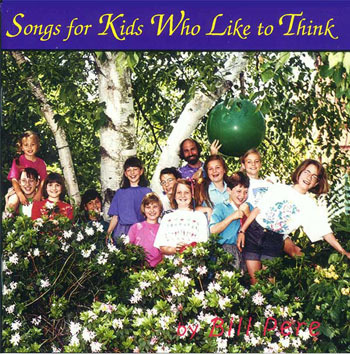 "My daughter just keeps playing it over and over -- and now I'm singing the songs too"
Songs For Kids Who Like to Think is Bill's first collection of songs, designed to foster positive discussion and interaction between kids and their parents. The recording features Bill's clever, well crafted lyrics, singable music, and harmonies by the LUNCH Ensemble. The tracks are orchestrated with Bill's distinctive full band arrangements featuring 12-string acoustic guitar and Midi guitar. "Homunculus" is one of Bill's very best story songs, which appeals equally to children and adults. "Give the Children a Tomorrow" is co-written with multi-Parents Choice Award winner Les Julian, and has been widely performed in concert. And "Word Twister" shows off Bill's linguistic acrobatics. This collection will make you think -- whether you're a child or a parent. 13 Tracks, 49 minutes, Lyric Sheet Included ! Songs For Kids Who Like to Think is part of Bill's children's collection, which also includes "Songs For Kids With Common Scents", "Songs For Kids Who Touch the Stars", "Profiles of Connecticut", and the yet-to -be released "Songs for Kids Who Dare to Dream "